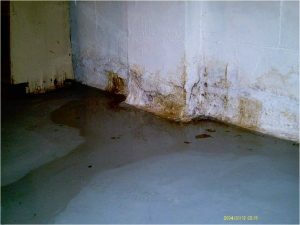 Water seepage is the culprit of most basement problems. When you have water in the basement (whether it is condensation or two feet of water) it is a problem. Water in the basement can destroy your belongings. It can cause mold, mildew, and rot, and can lead to serious foundation issues. A water problem in the basement usually means there is hydrostatic pressure building up outside the basement wall. If left unattended this can lead to major structural problems such as foundation settlement, cracks (structural and non-structural) and can even cause a foundation wall to collapse. Water typically comes in through foundation cracks or through the seams between the foundation wall and the concrete slab at the floor joint known as the cove. Sometimes water comes up through the concrete slab. If you have a concrete block wall, water can enter through the weep holes in the wall or infiltrate through the grout lines. Excess water and moisture in the basement can create an unhealthy environment for the entire house. The air that is in the basement is brought up to the upper levels of the house through what is called “stack effect.” The ideal humidity level in a basement should be 50%. Anything more than that is a breeding ground for fungus, mold, mildew, and dry rot.